Mission Statement: To promote the art and science of surgery by publishing relevant peer-reviewed clinical and basic science information to assist the surgeon in optimizing patient care. 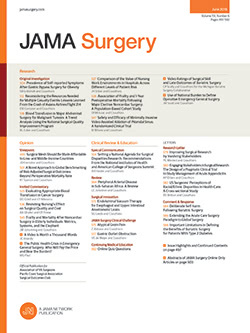 JAMA Surgery will also serve as a forum for the discussion of issues that involve ethics, teaching, surgical history, and socioeconomic concerns. The JAMA Network is a consortium of peer-reviewed print and online medical publications that includes JAMA, JAMA Surgery, and other specialty journals. All articles published, including editorials, letters, and book reviews, represent the opinions of the authors and do not reflect the policy of the American Medical Association, the Editorial Board, or the institution with which the author is affiliated, unless this is clearly specified.